For those outside of the United States, the Midwest is experiencing extremely cold temperatures today. UPDATE: A Canadian visitor to TPV suggested that a great many people who live outside of the United States have no idea where or what the Midwest is. It’s generally defined as a region of the north-central United States around the Great Lakes and the upper Mississippi Valley and considered to include Ohio, Indiana, Illinois, Michigan, Wisconsin, Minnesota, Iowa, Missouri, Kansas, and Nebraska. 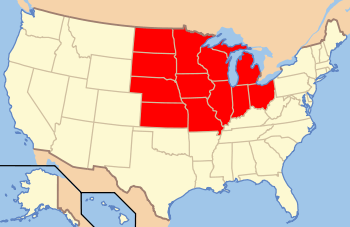 The northernmost Midwestern states abut Ontario, Manitoba and Saskatchewan. The lowest temperatures in decades brought life to a near standstill for millions in the Midwest and beyond as a polar vortex blanketed the region, closing schools, businesses and even halting mail delivery. The icy blast prompted governors to declare states of emergency in Wisconsin, Michigan and Illinois as windchill temperatures fell to minus 50 degrees Fahrenheit across much of the Chicago area and near minus 70 across parts of the upper Midwest. Thousands of flights were canceled and Amtrak canceled all trains in and out of Chicago. The temperature of minus 24 degrees in Chicago broke a record for Jan. 30 and neared the low set on Jan. 20, 1985, when the temperature dipped to negative 27 degrees, according to the National Weather Service. Public and private schools were closed across the upper Midwest along with museums, zoos and churches in Chicago. Some university campuses were closed, including Northwestern University in Evanston, Ill., and University of Notre Dame in Indiana. Streets were empty as scores of businesses closed or asked employees to work from home. The agency said the coldest spot was Buffalo, N.D., with a reading of minus 49 degrees and the coldest windchill was in Park Rapids, Minn., at minus 65. Over half of scheduled flights to and from Chicago’s O’Hare International Airport and 60% at Midway International Airport were canceled, according to flight-tracking website FlightAware. The site said that in all, more than 2,400 U.S. flights had been grounded as of early Wednesday afternoon. The U.S. Postal Service canceled mail delivery in Illinois, Iowa, Minnesota, North Dakota, South Dakota, Wisconsin, and parts of Kansas, Missouri, Montana and Nebraska. 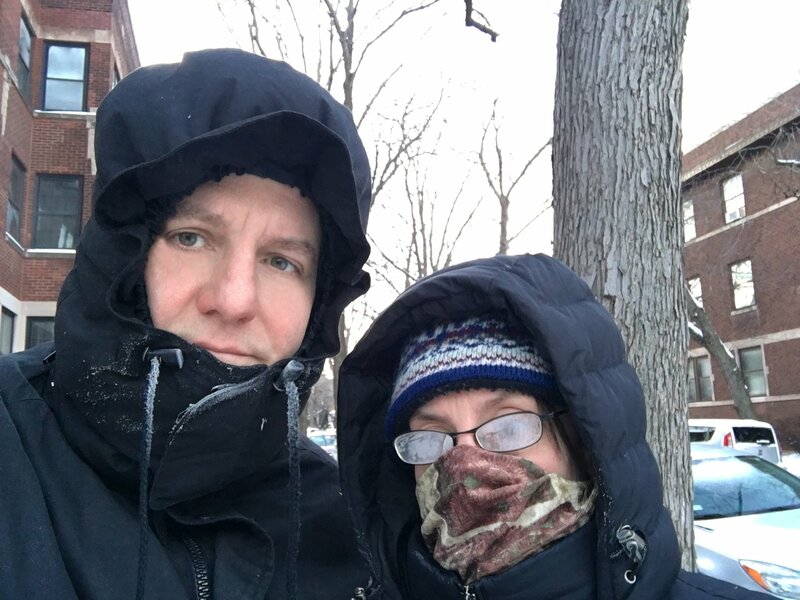 Having lived in Chicago and Minnesota during very cold weather, PG empathizes with visitors to TPV who are experiencing these temperatures. PG remembers that when the heating system in his abode was operating at full capacity and the interior temperature was slowly declining, it wasn’t a great feeling. PG suggests it’s a good day to stay inside and read. Or write. I grew up in eastern Nebraska and remember seeing the Elkhorn and Niobrara rivers frozen hard enough to walk on. The Army Corps of Engineers later used explosives to break up the ice chunks so they didn’t rear down the bridges on the Missouri River. I actually did walk uphill, both ways, to high school. When I stayed after school for various activities. There was a hill going up and then another going down. I love that I can say, truthfully, I walked to school, uphill, both ways. But not in the snow. Okay, wait… FROM school. Not to. We carpooled in or I rode my brother’s bike. Ah, the “Cold Temperatures” tales. I don’t know what the other guy was running, but dad had one of those little four watt toys and a clip-on antenna. SATX chatted with somewhere in northern Montana for another fifteen minutes before the sun came up and blew away their skip. Lucky me, I spent more of my tour there on the grave shift (2300 to 0700 for those wondering) and the first third of my shift was spent going bird to bird (aircraft) keying in the codes for the new day. Though another word was said. They waited until the captain had run on for a bit before keying their mike. There was about thirty seconds or so of dead silence followed by a much deeper voice than mine going ‘Heh heh heh’ and then giving us all a mike drop. Said captain then went into orbit without needing a JATO pack and that channel kind of died because no one wanted to say a word. Our other maintenance channel then came to life, mostly laughing at the captain’s five degree report. As someone living in Taiwan, which is a far distance “outside of the United States”, I find it strange that you would say, “For those outside of the United States, the Midwest…” because most people outside of the United States have no idea where or what the Midwest is. Even for me, someone who was born and raised in Canada, I’m not exactly sure what constitutes the Midwest. But to me it’s also strange that Americans will insist on saying things like “Miami, Florida,” “Houston, Texas”, “Los Angeles, California” but then turn around and say something like “Toronto, Canada” or “Montreal, Canada” or “Vancouver, Canada”. A key problem is that a whole lot of city names are not as distinctive as Houston. There is a huge amount of name duplication between states, many names of which originated somewhere else. That’s not really the problem. I would agree that most cities in Canada are distinctive, but, the proper name is not Toronto, Canada, it’s Toronto, Ontario. Just as cities in America are denoted by city, state, Canadians cities should be denoted by city, province. I agree with you that Canadian cities should be stated by city, province. I misunderstood the discussion point. I’ve had similar discussions with some Europeans over the years, but they often thought that provinces and states should be omitted (e.g Versailles, USA; Toronto, Canada). I can agree with that. For example, Australia also has states but I have no idea which states either Melbourne or Sydney are in. But I think North Americans should be familiar with both the states and the provinces in the two respective countries. Once again, for example, as a Canadian I may not know exactly where Massachusetts is (or how to spell it), but I do know that it is a state in America and that Boston is in it. Founded in 1809, Miami University is located in Oxford, Ohio. Miami, FL was founded in 1825. I KNEW we moved to California from New Jersey at the right time – late last summer – but then was the Paradise Camp Fire, just upstate. Now I’m positive – I swam in the outdoor pool yesterday, and went for a ride on the trike the day before. I don’t think I’d survive the current weather. People like me are pretty much home-bound under those conditions. Greetings from Chicago. We went out for a walk yesterday. It was a short one. We’ll probably do it again today, just to make sure. This was the In Search of… episode about the last big cold snap in 1977. This is useful for story in that they have known since 1958 that a slight warming could cause an Ice Age. There were a ton of novels written in the 1980s about the next Ice Age, last time this happened. I preferred them to all the current novels about rising sea levels from global warming, they don’t fit reality. In all the current stories, the Arctic Ice clears. Green Earth by Kim Stanley Robinson is a good example of writing global warming stories that do not reflect reality. The story begins a full year after the Arctic Ice is gone. The novel becomes a dream of living in a tree house, sailing a regatta around the North Pole, and trying to restore some balance, all pure fantasy. The latest storms are caused when the Arctic Air flows over the Great Lakes, picking up moisture, then dropping it as snow. If areas of the Arctic Ocean become free of ice, then you have even larger areas of water to draw moisture from and cause storms. If the Arctic Ice actually clears, then you start having massive snow storms in the Northern Latitudes, and massive rain in the Middle Latitudes. – A year of snow, a year of rain, will kill billions. This was on the PBS NewsHour, 30 January 2019. In the second part they mention a region of ice that warmed, opening up a stretch of ocean, and triggered the latest shift of the Polar Vortex. All of this goes into my story folders. Now, imagine what would happen if this lasted for months. I want to see future stories that match reality. So many novels today merely echo the fears and desires of people based on myth. What I found interesting, is that two movies that I watched lately had the villains claim that the Earth would be unlivable in just one or two generations. The fear has gone that deep. Don’t get me started on Interstellar. HA! When I hear that stuff I think of Doctor Evil from Austin Powers asking for a “100 Billion” dollars in 1969, and getting laughed at. There’s more than one way to make a place unlivable. BTW, In the 90s when it was written, it could be considered farce, but the story hits too close to home now. It has become all too possible. HA! It is meant as both: a homage to old-school SF fandom and a cautionary tale about climate zealots. Like other Niven/Pournelle stories it gets both the science and the human factors all too accurately.